Medicines currently benefit from free movement across Europe. For Ireland, many of the medicines on the market are dual English packs for Ireland, UK and Malta. Brexit has the potential to disrupt the provision of medicines to not only UK patients, but Irish patients too. Why is this? The medicine supply chain is a complex International trading arrangement. Active ingredients are usually manufactured in cheaper manufacturing bases in Asia, before then being sent to a pharmaceutical company for processing into the tablet, capsule, or liquid that can be taken by a patient. These products may have time critical deadlines – short expiry dates for example adrenaline mini-jets, adrenaline auto-injectors, or may require refrigeration such as insulin biological products, and anticancer agents. Delays at ports and or airports between Ireland and the UK could result in the medicines delivered to the patient having a shortened expiry for use, pushing up the supply required per patient per year. Disruption will place substantial pressure on hospital pharmacy teams who are already continuously responding to supply issues in the present supply chain. Hospital pharmacies are scanning for potential disruptions, taking action by sourcing alternatives and working with prescribers to ensure patients continue to receive a safe supply of medicine. The EAHP has described medicines shortages that are currently experienced in the pre Brexit era as serious, and a threat to patient care in hospitals, requiring urgent action (EAHP Practice and Policy Medicines Shortages available here). The EAHP has identified medicines shortages as a diversion of significant amounts of the time and attention of a hospital pharmacist, diverting from other tasks. Irish hospital pharmacists daily face an empty shelf when looking for potentially life altering medicines. During the ‘Storm Emma’ disruption many hospital pharmacies in Ireland had to resort to the Irish Army for deliveries of much needed medicines. Imagine a situation where these medicines are not stuck in Ireland at a warehouse, but at an international border. The HPAI as the representative body for Irish hospital Pharmacists has written to the Minister for Health to ensure that the Government of Ireland has an awareness of this issue. Members can view the letter and initial response on the forum. The HPAI is awaiting a formal response, and plan from the Government of Ireland on this issue that will cause significant disruption to Irish Hospital patients, and has the potential to divert already under pressure pharmacy resources from front line clinical duties. Whilst no one wants a no deal Brexit, even a good deal may result in significant disruption to the provision of these complex goods, and the HPAI advocates that the Government with stakeholders prepare a report and work on mitigating this disruption to Irish patients. The adoption of pharmacy dispensary automation is low in Ireland. The benefits in terms of safety, stock management, accountability, security, speed and efficiency are now well understood and have been implemented elsewhere. 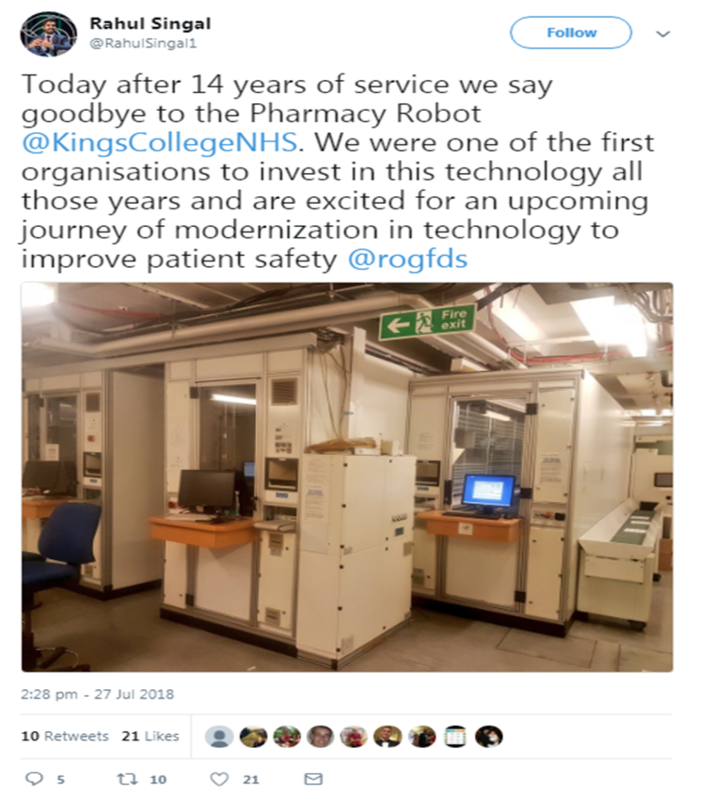 This tweet celebrates the replacement of automation at a well known London hospital. They have enjoyed the benefits of this central piece of infrastructure for 14 years and are now replacing with updated and upgraded hardware. We are in a beneficial position where hospital pharmacy in Ireland has largely missed out on the developmental and refinement pitfalls due to the low uptake and could now purchase mature offerings from vendors, if resources were made available. The ever increasing adoption of pharmacy dispensing automation is allowing the redeployment of hospital pharmacy teams away from traditional dispensary based activities and in to near patient clinical activities. By providing these ward based services pharmacy teams are generating both increases in the quality of patient care and ensuring the maximum return on the financial investment in costly medicines. After all if patients are treated optimally with their medicines and get the support to ensure they are taking them correctly they stand to get the best outcomes from treatment. This increasing use of specialist pharmacists in ward environments, using their in depth knowledge of pharmacotherapy is supported by the HPAI in their negotiations to enable specialist pharmacists to be recognised and supported by the largest employer of hospital pharmacists in the state. With a robust structure for expanding services and investment in developing hospital pharmacy around the country both patients and the taxpayer alike stand to benefit. If you are a hospital pharmacist member of the HPAI we are negotiating on your behalf to ensure that practice is supported and developed. Firstly, thank you for maintaining your support of the HPAI, which has enabled us to get to this critical point in negotiations with the HSE. It is more important than ever to be a member of the HPAI as it adds weight to the negotiations. Fórsa, guided by the HPAI, are the only body authorised to negotiate on terms and conditions with the major employer of Hospital Pharmacists in the State. If Hospital pharmacists have been waiting for the “right moment” to join, the announcement of progress on this long standing issue is a key opportunity to maximise our strength in numbers to get an agreement across the line. Please consider asking colleagues to sign up to show their support for the development of the profession of hospital pharmacist, the recognition of specialisation, and the need for structures to drive practice development in pharmacy in the hospital sector. This will ensure that Hospital Pharmacists can sustainably build on their existing work improving patient care, safety and providing maximum value from the use of medicines. We will keep members updated of any developments via the membership forum. HPAI member and CUH senior pharmacist Dr. Virginia Silvari has been invited to join the EAHP Scientific Committee. This committee promotes professional development for European hospital pharmacists and plays an important part in organising the annual EAHP conference. Virginia has had a long-standing interest in continuing education and is an active member of the HPAI Cardiology SIG. Following her attendance at the EAHP Pharmacy Practice Research Academy in September 2017, Virginia answered the call for expressions of interest to join the Scientific Committee. Following a rigorous selection process and two day interview, she was invited onto the Committee, along with fellow candidates Jonathan Underhill (UK) and Aurelie Guerin (France). Virginia hopes that her participation on the Scientific Committee will give the HPAI a voice at that table and continue the long-standing commitment of the HPAI to the EAHP. The HPAI wishes to congratulate Virginia on her appointment! The links give a flavour of the high quality of lectures, workshops and seminars that were held. Which is the most valuable? In their own way and dependant on the task in hand they are exactly the tool you need for the job. If I had to cut out many items from pieces of paper, my can opener which previously saved the day would be cast aside for the scissors. Again a fine set of sharpened stainless steel scissors would allow me to accurately and comfortably cut out the items quickly and safely. But then there is the Swiss army knife. Often received as a gift and for some always found close at hand, it is not designed to do any one specific function better than a specialist tool could. Instead it has been exquisitely developed, refined and honed to be the answer to a multitude of tasks. For that reason it can often be found carried by people who consider themselves ready for any eventuality. "Where does this link back in to hospital pharmacists?" I hear a muffled cry. Well, in areas where you have a high volume of similar tasks a specialist tool is best placed to meet this demand. It has been developed to deal with a tight grouping of functions in the same way, quickly and safely. In the case above think scissors and can opener. However in more unpredictable, general scenarios sometimes you need to hedge your bets and have a multi purpose tool that can cope with just about anything that is asked of it. When we were asked to consider the career structure for Irish hospital pharmacists we recognised that being a generalist could be a speciality in itself. It was no more or less specialised than working in a clinical niche for the majority of the day. The further training and development needed to cover several specialist clinical areas to a high level required training and development akin to that needed to work in depth in any single specialist medical area. Every department has a pharmacist that fits this bill. They can be dispatched to any far flung corner of a hospital and be relied upon. This is often down to skills developed through experience and blended training applied over time to a range of clinical areas. It is for this reason that when job description reviews were conducted with the HSE in 2017 as part of the implementation meetings, discussions were tabled over the the meaning of "specialist" and "specialism" in Irish Hospital Pharmacy in order to acknowledge the diverse ways that hospital pharmacists have and continue to develop high level input to patient care. The IMPACT directive. It gets in the way, it frustrates. The limitations to practice, the feeling when another request comes through that will trigger a debate between the pharmacist, the requestor and if you are really luck hospital management. But if you look at the directive and what it is in response of and what goal it is intended for it becomes clear that often frustrations that should be brought to bear on a log jammed bureaucratic process are transferred to a piece of paper. There is (and was several years ago) consensus that the practice of hospital pharmacy has advanced to the point where the agreed employment structures for pharmacists within the HSE were no longer fit for purpose. Pharmacists in a significant number of hospitals were no longer confined to dispensaries, they were working closer to patients ensuring that all elements of medicines management were covered. Specialism was developed by pioneers in the profession and then became expected as the outcomes of this work filtered out. To this day a wide variation can be seen in the provision of clinical pharmacy services which is not linked to the size or complexity of the hospital covered. By virtue of being the largest employer this situation impacts the whole of the profession, as both legal, regulatory and market factors are hugely influenced by both the HSE and the Department of Health. The current career structure does not recognise the work of these pioneers, or give encouragement and support to those that today have the drive and commitment to improve the use of medicines for hospital patients in Ireland. Specialism is happening in a fragmented way, unsupported nationally and in many cases locally (without guidance and direction from national employers). In areas where specialism has occurred support for upgraded job descriptions has faltered once the operational necessity of having people in post has been satisfied. In the case of antimicrobial stewardship pharmacists, we have seen their work develop into a true speciality working as peers with Consultant and Registrar grade medical staff to ensure safe prescribing and monitoring is effective. Outcomes around antimicrobial stewardship have improved partly due to the work of this group of pharmacists. These pharmacists are not recognised by their employer as specialised. We have acted in good faith in the provision of new services but have waited for years for agreed implementation of the career structure which has not been forthcoming from the HSE. In this way we devalue our contribution to Irish healthcare and our perceived value to the HSE. Compare where we are to the Medical and Nursing profession. We work collaboratively with Doctors and Nurses every day. We are used to seeing individuals in both groups take up opportunities for further training and development in order to specialise and to be recognised as such. They have the apparatus to achieve this which brings a benefit to patient care. The concept of a Senior doctor or nurse who would know everything about anything due to the amount of time they have practiced is inconceivable. Why is this the case for Pharmacy? Specialism is rightly difficult and hard work to achieve but with it should come recognition from colleagues, managers and patients alike. The IMPACT directive is borne out of the HSE’s failure to implement what it agreed upon. An agreement that was made, based on the principle of providing a structure to enable modern pharmaceutical care for patients. A principle that holds just as true today. Hospital pharmacists are competent and confident that their roles could be expanded, with the underpinning support to drive better patient outcomes. Pharmacists are part of the solution to the question of how to manage increasing complexity in healthcare coupled to an ageing population with the corresponding increase in co-morbidity and polypharmacy. The HPAI continues to represent Hospital Pharmacists at national industrial relations meetings in an effort to ensure the implementation of the Hospital Pharmacist career structure. The addition of a reference to the implementation of this structure in the HSE Operating plan for 2018 is welcomed by the HPAI. However the sustained support of the membership of the association and for the IMPACT directive is critical to ensure that Hospital Pharmacy is transformed, making it fit for the present and future. There has been recent interest shown by the HSE in the consideration of the adoption of modern IT facilities both within hospital pharmacy dispensaries and on the wards in the form of prescribing software. The benefits of these systems are huge in several outcome areas. One of the few advantages of finding yourself behind the curve of adoption of technology is that others have had the chance to test and fix what was once novel and now mainstream pieces of software. The HSE can, as a result look to a developed market and select a product that offers the best balance of features, safety, usability and value. In other health systems the adoption of this type of technology has empowered hospital pharmacy practice and has led to increased time at the patient's bedside for clinical work. The ability to alert pharmacists to new patients, dose changes, delayed administration or supply requirements all result in the work coming to the pharmacist rather than the pharmacist hunting for work amongst the drug kardexes. The correct adoption of technology allows for seamless connection of dispensary automation and drug storage units along with procurement to smooth logistics. To achieve these benefits, there needs to be a realisation that the adoption of technology is only a catalyst to drive changes in processes. Simply buying the best software and hardware doesn't guarantee the best outcome. This is greatly swayed by the implementation, system administration and ongoing support for medicines management processes at ward and pharmacy level. Pharmacists have proven that they are integral to the successful deployment of e-prescribing. However the disparity in the level of clinical pharmacy provision within HSE hospitals risks any implementation of such systems. In order to underpin the modernisation of processes, a modernisation of the Hospital Pharmacist profession is required. Without structures that can cope with taking the lead on all aspects of medicines management, the large investment required in infrastructure will be at risk. It is for this reason that the HPAI continues to work to ensure the implementation of the Hospital Pharmacist career structure, to ensure that Pharmacy is represented at senior levels to ensure medicines management related projects are expert led within all hospitals.